Sometimes pregnant women can feel like they are the human equivalent of egg shells. It seems as if they can’t even move without someone dashing forward to help in the belief that the merest bump can send them crashing to earth. Husbands and partners can be the worst offenders, although this is entirely understandable. However, for the woman herself, this increased care and attention can become tiresome all too quickly. “I’m not ill, you know,” you can hear them inwardly protesting as yet another stranger takes them by the arm and guides them to the restaurant table, or off the bus or train. Of course, in the interests of politeness, the inward frustration will be hidden by a glowing smile and a thank you. This attitude often comes to the fore when a pregnant woman brings up the subject of classes at her local gym. Friends and relatives will frown disapprovingly and rush off to make a soothing cup of tea, but the truth is that exercise classes can be beneficial to mother and baby, helping the former to tone the muscles that are going to be vital as junior grows ever bigger in the run-up to the due date. We’re talking pelvic floor here, gals. The important thing to remember is that classes, whether they be designed to tone the body or soothe the spirits, should only be undertaken following consultation with the individual’s GP. The doctor will be only to delighted that the mother-to-be intends to be up and about rather than lounging on the couch, but care and attention must be the watchword when attending a class. 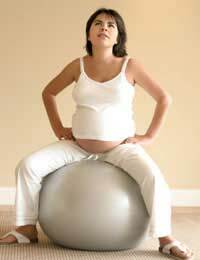 It is likely that the gym will run classes specifically for pregnant women because incorporating them in regular sessions can lead to scheduling problems, simply because mobility is always an issue. Regular stretches involving prone and supine positions won’t be possible, so an alternative set of reps will be in place. The emphasis will most definitely be on low impact, too, together with stretching that promotes relaxation. Longer warm-up and warm-down periods are also likely to feature, with the accent very definitely on taking things slow and easy. When attending a class, never be afraid to keep up regular communication with the instructor. You’ve got to tell them immediately if you feel faint or dizzy, or a particular stretch is proving uncomfortable. Never be tempted to let your self-concious nature take over, or feel you don’t want to appear weak in front of your fellow classmates. Not only will gym classes improve your strength and flexibility, but they can also prove useful in extending your social circle to fellow mums to be. You’ll be able to talk over common problems that you may be encountering, or even come up with suggestions that may improve the classroom experience. If nothing else, spending time with other pregnant women means you won’t be on the receiving end of patronising glances and unsolicited offers of help when you are perfectly capable of piloting both yourself and junior through those vital months. Back on the high street, if frustration does get the better of you, then resorting to a very audible, “I’m not ill, you know”, may prove just the ticket for easing tension in both mind and body.